Action from the Peterborough Premier Division game between Crowland (yellow) and Leverington. Photo: David Lowndes. Five Peterborough Premier Division sides were in cup action yesterday (November 26) and only Netherton United emerged victorious. The city stars, losing finalists last season. moved into the quarter-finals of the Northants Junior Cup with a resounding 6-1 win over Desborough Reserves at the Grange. Action from Leverington's win in the Peterborough Premier Division at Crowland. Photo: David Lowndes. Netherton dominated the game from the start, but couldn’t convert their chances. They struck the woodwork three times before the visitors broke away to take the lead just after the half-hour. But Jon Harrison’s heroes were level before the break when Rob da Silva haeded home captain Herbie Panting’s free kick and then they really turned on the style to romp home against a team well clear at the top of the United Counties Premier Reserve Division. Adam Scott helped himself to a hat-trick, while Da Silva added his second goal and Tom Randall also netted for the Premier Division leaders. Peterborough Sports reserves’ scheduled fixture in this competition against Blisworth James King will now take place next Saturday (December 3). Action from Crowland 1, Leverington 2. Photo: David Lowndes. 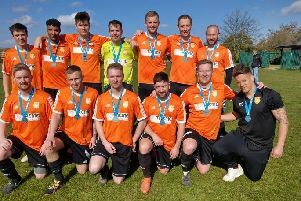 There was a Peterborough League wipeout in the quarter-finals of the Hunts Intermediate Cup with top-flight sides AFC Stanground Sports and Sawtry plus Division One outfit Riverside all failing to join ICA Sports - winners last weekend (November 19) - in the last eight. Stanground lost 7-4 at home to St Neots Town Reserves, while Sawtry were also beaten on their own turf, 3-1 by Bluntisham Rangers. Riverside were predictably crushed 8-0 by top Hunts team Eaton Socon. Moulton Harrox lost their Lincs Junior Cup tie 4-2 on penalties at North Somercotes United after a 3-3 draw and Stilton United crashed out of the PFA Senior Cup at home to lower level Warboys. Warboys are unbeaten in Division One though so a 4-0 win was not that big a shock against a team who are losing players on a regular basis. Cricketing Cafferkey brothers Michael and Elliot scored for Warboys as did Adam Hyde and Dan Moulds. Pinchbeck United are likely to receive a bye as Holbeach United Reserves pulled out of their tie after failing to raise a side. The second string lost several players to first-team call-ups. None of the Premier Division top five were in league action, but sixth-placed Ketton missed the change to gain ground after slipping to a 5-2 home defeat at the hands of improving Langtoft United. Ashley Firth and Lewis Bradley both scored twice for Langtoft. Wisbech Town Reserves have joined Ketton on 24 points after goals from Dale Palmer, Aaron McKenna and Sam Cubberley (penalty) secured a 3-0 win at bottom club Thorney. Deeping Rangers Reserves threw away a 2-0 lead to draw 2-2 with Uppingham. Talal Karama scored both Deeping goals. And Crowland failed to christen their new kit with a victory. Leverington took the three points from Snowden’s Field thanks to an 87th-minute strike from Paul Wierzbicki. Stilton United 0, Warboys Town 4 (M. Cafferkey, E. Cafferkey, Hyde, Moulds). Postponed: Pinchbeck United v Holbeach United Reserves. North Somercotes United 3, Moulton Harrox 3. Netherton United 6 (Scott 3, Da Silva 2, Randall) Desborough Town Res 1. Sawtry 1, Bluntisham Rangers 3. Eaton Socon 8, Riverside 0.